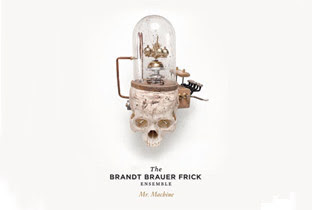 With the release of Mr. Machine, Brandt Brauer Frick abandons the laptops heard so prevalently on their debut album, the electro-classical, You Make Me Real, in favor of a healthy ten-piece ensemble. This intimidating dose of orchestral backup allows the German trio- Daniel Brandt, Jan Brauer, and Paul Frick- to advance their craft somehow without sacrificing any of the group’s synthetic aura. Violins, tromphones, percussion, synths, harps, et cetera all unite in a way that would seem chaotic if it weren’t so seamlessly utilitarian. For lack of a better term, the Brandt Brauer Frick Ensemble has delivered an album of organic house music with Mr. Machine. And while this innovative technique does occasionally wobble under the weight of its ambition, the end result is a resoundingly impressive achievement for all involved. Mr. Machine boasts a strong emphasis on the crispness of sound lending each note its own life. In these moments, this isolated flow of tone renders the album an experimental marvel to behold. And while the album features four tracks reinterpreted from You Make Me Real (“You Make Me Real”, Mi Corazon”, “Bop”, “Teufelsleiter”) as well as three cover songs (“Pretend”, “On Powdered Ground (Mixed Lines), "606 ‘n’ Rock ‘n’ Roll”), each endeavor feels reborn as opposed to recycled. While primarily instrumentally-based, Mr. Machine does offer vocals from Ninja Tune’s Emika on “Pretend” and “On Powdered Ground”- unsurprisingly, these two tracks are the album’s weakest points. While the songs themselves are perfectly serviceable (and in “Pretend”’s case, actually quite good), they feel inconsistent with what surrounds them. But these minor quibbles are only slight detractions from the overall auditory experience. The frantic piano notes of “Bop” coupled with the eerie, Faustian violin screeches and disparate percussive/synth arrangements on “You Make Me Real” highlight the album’s first half. “Teufelsleiter” and “606” bring everything to a close with a pulsating rhythmic throb of horns, strings, and drums. The Brandt Brauer Frick Ensemble leave no doubt they have officially arrived on the scene. Where they go from here is anyone's guess.